You'll get in some beach time at Carpinteria State Beach and Arroyo Burro County Beach Park. Escape the urban bustle at State Street Underpass and Rincon Bike Trail. Explore the numerous day-trip ideas around Santa Barbara: Oxnard (Oxnard Beach Park & Mandalay State Beach). Dedicate the 22nd (Sat) to wine at some of the top wineries in the area. There's lots more to do: contemplate the long history of Old Mission Santa Barbara, take in the waterfront at Stearns Wharf, enjoy the sand and surf at Butterfly Beach, and admire nature's wide array of creatures at Santa Barbara Zoo. To find reviews, ratings, where to stay, and other tourist information, read our Santa Barbara trip maker app . Auckland, New Zealand to Santa Barbara is an approximately 18-hour combination of flight and bus. You can also fly; or do a combination of bus and flight. You'll gain 20 hours traveling from Auckland to Santa Barbara due to the time zone difference. Traveling from Auckland in June, you will find days in Santa Barbara are a bit warmer (26°C), and nights are about the same (15°C). Finish up your sightseeing early on the 25th (Tue) so you can go by car to Pismo Beach. Pismo Beach is a city in San Luis Obispo County, in the Central Coast area of California, United States. Kick off your visit on the 26th (Wed): take in the dramatic natural features at Morro Rock, enjoy the sand and surf at Morro Strand State Beach, then identify plant and animal life at Wildlife Areas, and finally enjoy the sand and surf at Eldwaylen Ocean Park. Get ready for a full day of sightseeing on the 27th (Thu): stroll through Pirate's Cove Beach, grab your bike and head to Bob Jones City to Sea Bike Trail, and then kick back and relax at Avila Main Beach. For reviews, maps, other places to visit, and tourist information, go to the Pismo Beach holiday app . Traveling by car from Santa Barbara to Pismo Beach takes 2 hours. Alternatively, you can take a bus; or take a train. While traveling from Santa Barbara, expect a bit warmer days and about the same nights in Pismo Beach, ranging from highs of 30°C to lows of 13°C. Finish your sightseeing early on the 27th (Thu) to allow enough time to drive to San Simeon. You'll enjoy a bit of beach vacationing at Moonstone Beach and William Randolph Hearst Memorial Beach. 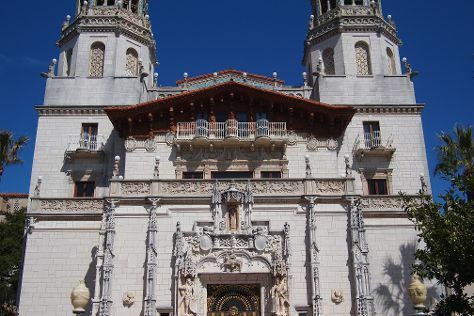 Hearst Castle and The Old Santa Rosa Creek Chapel will appeal to history buffs. There's still lots to do: look for all kinds of wild species at Elephant Seal Rookery, explore and take pictures at Moonstone Beach Dr, view the masterpieces at Ephraim Pottery West Gallery, and do a tasting at Hearst Ranch Winery. For more things to do, traveler tips, ratings, and other tourist information, refer to the San Simeon day trip tool . You can drive from Pismo Beach to San Simeon in 1.5 hours. Another option is to take a bus. While traveling from Pismo Beach, expect somewhat warmer days and about the same nights in San Simeon, ranging from highs of 39°C to lows of 13°C. Finish your sightseeing early on the 30th (Sun) to allow enough time to drive to Monterey. Monterey is a city in the U.S. Your cultural itinerary includes sights like Cannery Row and Casa Serrano, Historic Adobe. Get in touch with nature at Dolphin & Whale Watching and 17-Mile Drive. You'll find plenty of places to visit near Monterey: Moss Landing State Beach (in Moss Landing), Aptos (Manresa State Beach & Seacliff State Beach) and Natural Bridges State Beach (in Santa Cruz). And it doesn't end there: explore the activities along Monterey Bay, explore the landscape on two wheels at Monterey Peninsula Recreational Trail, and admire nature's wide array of creatures at Monterey Bay Aquarium. To see other places to visit, maps, where to stay, and tourist information, you can read our Monterey tour itinerary maker app . You can drive from San Simeon to Monterey in 3 hours. Alternatively, you can take a train; or do a combination of car and bus. Traveling from San Simeon in June, expect nights in Monterey to be about the same, around 13°C, while days are much colder, around 23°C. On the 5th (Fri), you'll travel back home.